My watercolor entitled “Flower Power” won the best of show award at the Broward Art Guild at the May, 2017 members show. 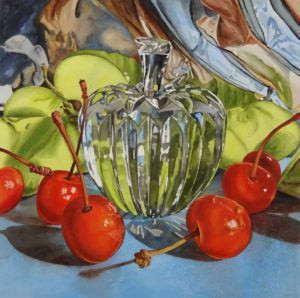 My “Crystal Apple” Painting won theFirst Place Blue Ribbon Award ($400) from the Gold Coast Watercolor Society’s Fall Show at the Coral Springs Museum on November 2, 2016. Broward Art Guild Food for Thought Exhibition, March 2015 – Honorable Mention Award for “Mangia/Mangia”.